Our beautiful FULL COLOR plaques allow us to include your business or club logo, typically at no extra charge. Placed on a classic white background, your multi-color logo or image will really make an impressive and appreciated award or gift! 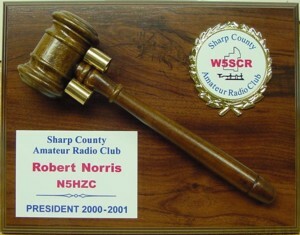 The sample below shows a gavel award plaque with two color plates. We also offer 5" x 7" and 6" x 9" plaques with full coverage plates. Email us for additional samples. Please drop us an e-mail for more information. You're welcome to include sample of your logo for a free evaluation and no obligation quote.